All photos by Daniel Schwartz. MONTREAL – Everybody knows that when you go to a Jewish diner, you order matzo ball soup. Or knishes. Or latkes. Or pickled herring. Or just about anything to do with lox. Not at Arthurs Nosh Bar in Montreal’s trendy St. Henri neighborhood. The thing to get here are pancakes. Or so I’m told by every waiter I talked to on my weekend in town. They’re the best pancakes you’ll ever have! Bold claims. They had to be investigated, so I taxied to the Jewish luncheonette to verify. It was a Monday morning, and I was in luck, as the place usually has a line out the door at this time. 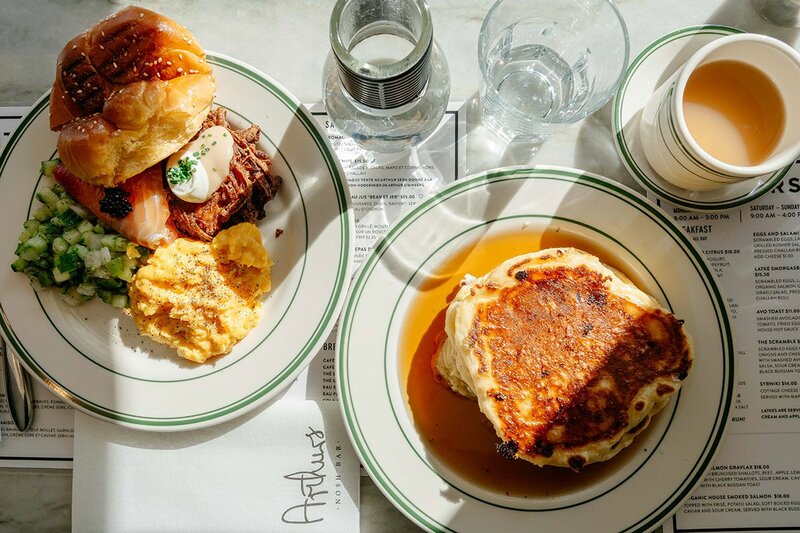 The hip brunch spot is run by Joe Beef alums Alex Cohen and Raegan Steinberg, daughter of the eponymous Arthur. (Which might make this the Russ and Daughters of Montreal.) 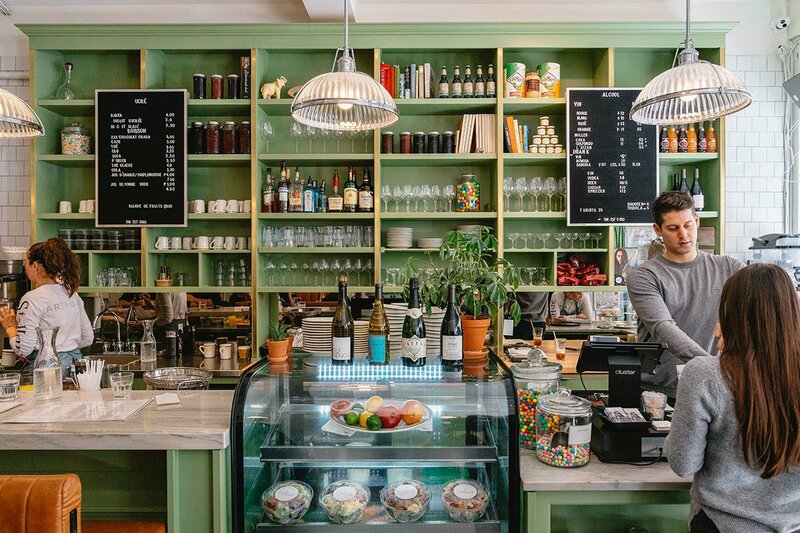 It’s got it all: penny-tiled floors, letter-board menus, leather banquettes, family photos on the wall, and updated Jewish classics. I took a seat by the window and scanned the menu. Chopped liver on toast? Great. Moroccan eggplant on challah? Hand it over. House-cured gravlax on a Fairmont bagel? I’ll take two. But these, it turns out, are no ordinary flapjacks. They’re syrniki, a gooier variety of hotcakes from Russia and Ukraine that come stuffed with cottage cheese and usually served with jam. Only this being Canada, they’re served floating in a pool of maple syrup. And to not anger my ancestors, I also ordered the Latke Smorgasbord, a platter of gravlax, caviar, scrambled eggs, a deep-fried latke, Israeli salad, and challah toast. That these pancakes were incredible should have been no surprise. But as a Jewish New Yorker, I never thought I’d choose anything over lox for breakfast. To set the record straight, it wasn’t the smorgasbord’s fault. It was delicious. I would gladly order it again. 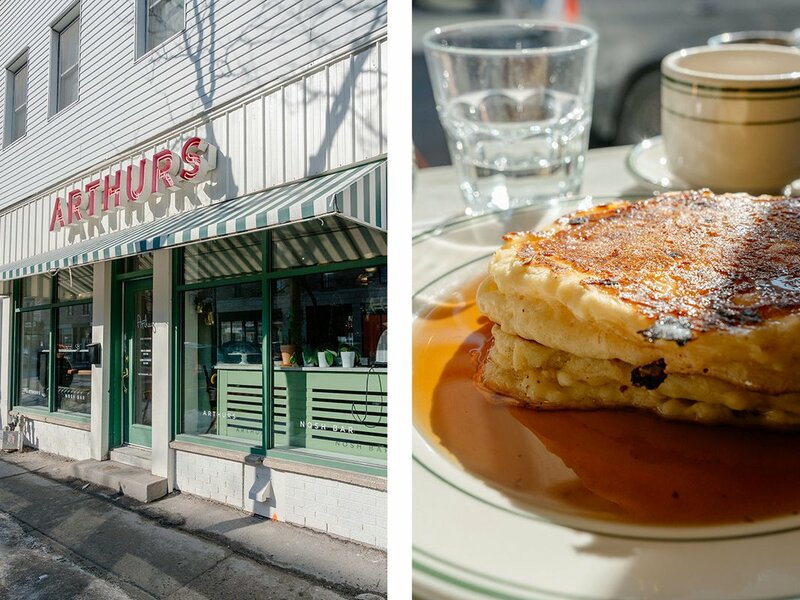 But those syrupy, cheese-stuffed pancakes deserved my full attention. Order the pancakes already. Extra hungover? Get them as the Grand Slam, with eggs, fried chicken, and beef bacon.